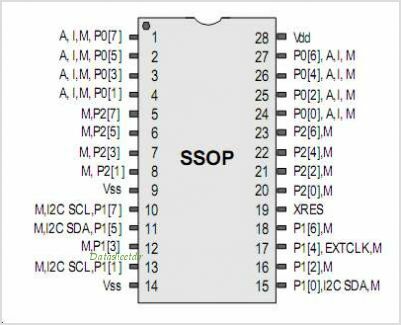 The PSoC, family consists of many Mixed Signal Arrays with On-Chip Controller devices. These devices are designed to replace multiple traditional MCU based system components with one low cost single chip programmable component. A PSoC device includes configurable Analog and digital blocks and programmable interconnect. This architecture enables the user to create customized peripheral configurations to match the requirements of each individual application. Additionally, a fast CPU, Flash program memory, SRAM data memory, and configurable IO are included in a range of convenient pinouts. By Cypress Semiconductor Corp. This is one package pinout of CY8C20534,If you need more pinouts please download CY8C20534's pdf datasheet. CY8C20534 circuits will be updated soon..., now you can download the pdf datasheet to check the circuits!